Record low rainfall in 2013 means the official “water year” designation for Lagunitas Creek in west Marin will be “dry” from April through October 2014 in accordance with MMWD’s water rights order from the State of California for the creek. This designation was made because there was less than 28 inches of rainfall at Kent Lake from October 1, 2013, through March 31, 2014. Average for that six-month period is 45.5 inches. 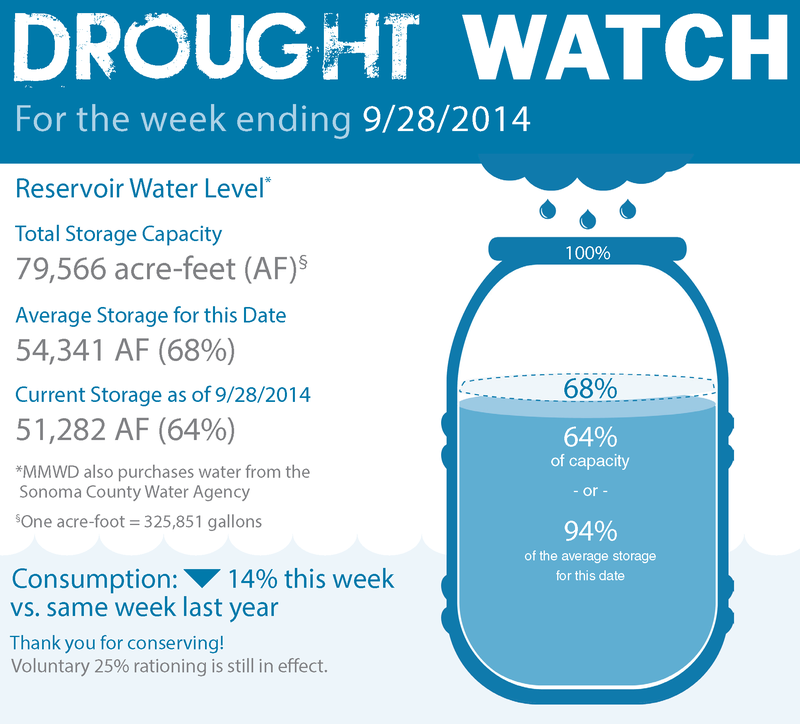 This year marks the first time a dry year has been in effect since the water rights order was issued in 1995. The in-stream flow requirements (water released from Kent Lake into Lagunitas Creek) applicable during “dry years” are slightly lower than the requirements for “normal years” and are designed to keep fish in good condition while preserving our water supply. The flow rate will be reconsidered in December 2014 depending on rainfall between now and then. MMWD releases water from Kent Lake into Lagunitas Creek throughout the year to maintain adequate flows for fish. MMWD has also reduced releases into Walker Creek from Soulajule Reservoir this spring. Reservoir Levels: As of May 25, reservoir storage is 63,306 acre-feet,* or 80% of capacity. The average for this date is 70,259 acre-feet, or 88% of capacity. Total capacity is 79,566 acre-feet. Rainfall: Rainfall this fiscal year to date (July 1-May 25) is 33.40 inches. Average for the same period is 51.90 inches. Water Use: Water use for the week of May 19-25 averaged 26.95 million gallons per day, compared to 30.69 million gallons per day for the same week last year. Supply source: Last week we averaged 18.04 million gallons per day from our reservoirs and 8.91 million gallons per day from the Russian River. Creek Releases: During the month of April 2014 MMWD released 196 million gallons, or a total of 601 acre-feet, into Lagunitas and Walker creeks in west Marin.